Mechanical pit-style dock levelers and edge-of-dock levelers are often the best solution for low-volume facilities. Modular dock bridges are another valuable solution, particularly in leased spaces, because they require no concrete work and provide a lower lifetime cost of ownership than many other types of dock levelers. With the smaller door sizes in these facilities, dock seals tend to be a better solution for providing an effective barrier against the elements. Depending on the climate in your location, you’ll want to consider either conventional insulated or non-insulated sectional doors for your loading dock. A variety of Kelley vehicle restraints are recommended for maintaining safety and security at low-volume facilities. However, rubber wheel chocks and ALS/MLS LED light communication systems can provide basic levels of safety. 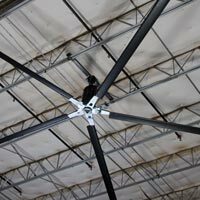 Extend the reach of your HVAC systems by installing high-volume, low-speed fans. These fans circulate the air, improving employee comfort while reducing energy consumption. Basic accessories such as LED Dock Lights or Turbo-ES trailer fans are often used to improve visibility and environmental conditions inside trailers.